The University of Wyoming removed “Carbon Sink,” by Chris Drury, after receiving complaints. LARAMIE, Wyo. 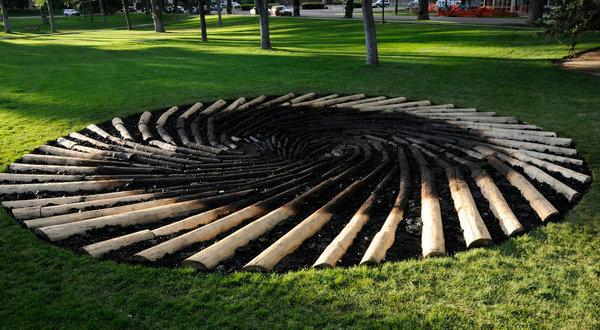 — The idea behind the sculpture that appeared on the University of Wyoming campus about 16 months ago was simple but provocative: a swirl of dead wood and lumps of coal, intended to show the link between global warming and the pine beetle infestation that has ravaged forests across the Rockies. And ever since the British artist Chris Drury installed the 36-foot-diameter sculpture, called “Carbon Sink,” the university has been embroiled in a bitter controversy, which eventually led to the quiet removal of the artwork last spring after energy officials and their political allies complained to administrators. The dispute over the sculpture — part of a series of campus installations commissioned by the university’s art museum — has continued to dog the university after it released e-mails discussing the artwork. The e-mails, first obtained by Wyoming Public Radio, showed that the university’s president, Tom Buchanan, privately asked that the sculpture be dismantled a year ahead of schedule because of the uproar surrounding it. His note followed objections raised by local lawmakers and officials in Wyoming’s energy industry, which helps support the university through state taxes and felt betrayed. What is this? Marion Loomis, the executive director of the Wyoming Mining Association, said to a university official in an e-mail, using a mild profanity for emphasis. “I am all for freedom of expression, but putting a permanent piece blasting the coal industry while taking millions in royalties, A.M.L. fees and severance taxes strikes me as a stab in the back.” A.M.L., short for abandoned mine lands, refers to a reclamation fee. Mr. Lubnau, a Republican from energy-rich Campbell County, said he subsequently told the university that he was not serious about cutting financing, and emphasized that he never called for the sculpture’s removal. Mr. Loomis, of the mining association, said that the group was not trying to tell the university what art to display, but that it had a right to complain about something it deemed offensive. But if the controversy is finished for the energy industry, it is not for the university. E-mails show that one university official told an alumnus that the sculpture was removed early from its perch on an expanse of grass because of water damage — an irrigation line had broken in the area. An editorial on Monday in The Casper Star-Tribune criticized the university for misleading the public over the reason the artwork was taken down. Dr. Buchanan declined to comment on the matter. Chris Boswell, a vice president at the university, said that the explanation given to the alumnus was a mistake, and that no official reason had ever been released. Mr. Boswell also pointed out that the sculpture remained intact for nearly a year — evidence, he said, that the university had not acquiesced to pressure. Amid the fallout from the controversy, lawmakers passed a measure that requires artwork for a newly renovated campus recreation center to reflect Wyoming’s history of transportation, agriculture and minerals. The measure also gives Gov. Matt Mead, along with the university’s Energy Resources Council — composed primarily of energy industry representatives — final say on the art selected. Mr. Mead, a Republican, said at a recent news conference that he did not feel it was appropriate for him to review the art. Jeff Lockwood, a professor of natural sciences and humanities who has been outspoken in his frustration over the university’s handling of the sculpture, said outrage had grown among students and faculty members. A version of this article appeared in print on October 27, 2012, on page A15 of the New York edition with the headline: Art That Irked Energy Executives Is Gone, but Wyoming Dispute Whirls On. University of Wyoming are now censoring all sculpture installations on Campus. Any new proposed work has to go before a committee which includes members of the energy companies. Read Jeff Lockwood’s new article in Wyofile.